This summer has flown by in a whirlwind with a constant flow of teams from all over North America. When the dust settles, we are astounded to see all that the Lord has accomplished in just a few short months. As those accomplishments are highlighted in this issue of Baby Talk, we hope that each and every one of you is encouraged to see the fruits of your labor. Whether you have labored so that you could give, labored with a hammer, or labored on your knees in prayer, your part in this ministry is invaluable. May the Lord bless you beyond what you could ask or imagine. Construction on the home is quickly approaching the finish line. Apart from some small finishing details inside, we are ready to start furnishing the home and stocking it with supplies. We are also currently working on a wall around the perimeter, a sliding gate at the entrance, and general landscaping around the home. Donna Werdenie is from Kingston, Jamaica. She has known Jesus as her Savior for 38 years. Donna is passionate about studying and teaching God's Word, prayer, and making a difference in the lives of those in need. Donna has years of experience working with children in evangelism and discipleship. She started studying Spanish in 2006 when she knew God was calling her to serve Him in a Spanish speaking country. Since then she has served on the mission field in Costa Rica, China, and Colombia. A few of the gifts she brings to GBH are teaching, artistic creativity, and a deep love for children. God's call over Donna's life is to raise up godly offspring and she feels that the purpose and goals of Grace Babies' Home are aligned with those the Lord has given her. Donna's favorite verse is 1 John 5:14-15, "This is the confidence we have in approaching God: that if we ask anything according to his will, he hears us. And if we know that he hears us, whatever we ask, we know that we have what we asked of him." Jody Kornelius is from Aldergrove, British Columbia. After knowing the Lord for most of her life, in 2006 Jody had a personal encounter with her Creator. When she persistently asked Him, "Who are you?" His answer came to her loud and clear ... Psalm 46:10 "Be still and know that I AM GOD." Jody has served in numerous ministries at her home church where she has worked in the media ministry and as a youth leader. She has led several mission trips to Mexico and served at Grace Children's Home for eight months in 2009. Jody is passionate about living her life as a servant wherever the Lord asks her to go, growing in her faith and knowledge of Him, and sharing His love through actions. She brings to the ministry her talents in communication and administration, photography, and encouragement. This is how Jody explains her call to GBH, "I saw a vision: the home was complete, there were babies all around and I could hear them laughing and crying and I saw myself standing in the midst of it all. As overwhelming as that was, a sense of peace washed over me and I knew that this was where God wanted me to be. I was finally home." The Strutton family is from Encinitas, California where Juan worked in information technology and Alicia managed their busy home with four children. 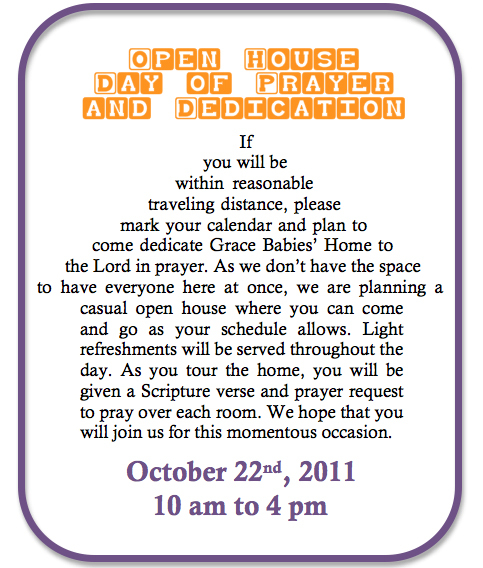 In August of 2006 they obediently followed the Lord's prompting to sell their home and wait for His further direction. While waiting, they became involved with Grace Children's Home. After many visits to GCH and months of prayer and fasting, they heard God's call to join YUGO Ministries and help fulfill His vision for Grace Babies' Home. In July of 2008 the family moved to Mexico to begin construction on the 6,400 sq. ft. facility for orphaned babies. Juan and Alicia currently live on the second floor of GBH with their children: Lucy, Sam, Joe, and Lily. As Director of Grace Babies' Home with YUGO Ministries, Juan's role is to raise funds for the construction and operation of the home, to see the project to completion, and to manage the facility once it is operational. Alicia and the kids support Juan in his role and help wherever they are needed. In order to meet our projected operating budget, GBH needs monthly baby sponsors. We are currently at 12% of our goal. If you feel called to support this ministry with your finances, your $40 monthly partnership will help feed, clothe and care for the needs of an orphaned baby while contributing to the monthly operations of the home. Click here to sponsor a baby now.